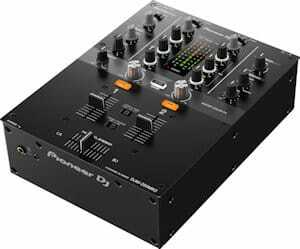 Enjoy a review of the awesome Pioneer DJ DJM-250 mixer and find out why I think it's Pioneer's best value mixer ever! Today I got to put the Pioneer DJ DJM-250 MK2 stand alone 2 channel mixer to the test. After the success of the original DJM-250 that was released back in 2011, Pioneer decided they could do even better. This is pioneers lowest priced mixer in the DJM series that will appeal to DJ's of all abilities. The mixer is intended for use with Rekordbox DJ/DVS and comes bundled with an activation key for both. This means the DJM-250 MK2's sound card is built especially for Rekordbox DJ. So if you wan't to use Serato or Traktor software you will need to connect a separate interface. 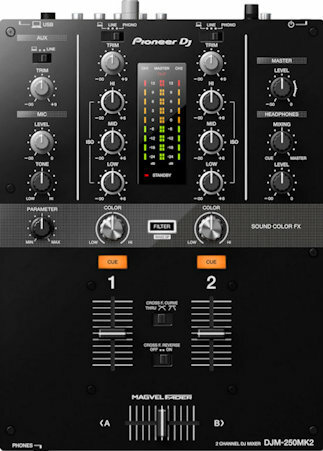 If this bothers you Pioneer have released the Pioneer DJ DJM-S3 mixer. The S3 is exactly the same but is built with a different sound card especially for Serato DJ. Obviously Pioneer want you to buy the mixer that uses with their own software. So the DJM-250 MK2 is priced much cheaper than the DJM-S3 running a sound card for Serato DJ. But the price of the DJM-S3 is still cheaper than buying a DJM-250 Mk2 and then purchasing a separate sound card for Serato. For any beginners here, Rekordbox is a digital DJ software that allows you to play tracks directly from your computer. Serato DJ and Traktor are the other 2 popular choices. You can read more on these two here. If you don't want to use software and wish to keep it simple, don't worry. This mixer can also be used to control turntables or CD players without the software. Just connect your CD decks or turntables in the normal way. It comes in at a great price considering it comes with software, and is within reach of anybody. It was less than $350 the last time I checked! That's where the DJM-250 MK2 outshines the DJM-S3. The S3 is $150 more at the time of writing! Bear in mind that the price of Rekordbox with the DVS add on would set you back $228 plus tax. So this really puts the value of this mixer into perspective. The first thing you notice is the weight of this mixer. It's all metal case makes it very tough and durable, but it weighs in at about 4 KG! I'm sure this wouldn't be a problem for anybody and would be seen as a bonus to many. Firstly it shows you just how strong and well built the mixer is. Secondly it may just be my heavy hands, but I very often have mixers moving around while scratching. The extra weight means this thing would definitely stick to the table! On initial impressions it comes across as quite a simple layout. 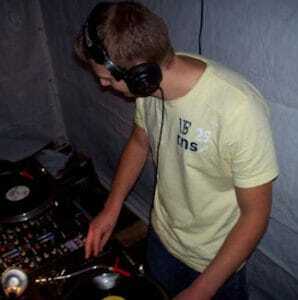 But experienced DJ's can get more creative by using the Aux input. Turntablists will like the uncluttered crossfader section. And beginners will enjoy the overall simplicity of the mixer. The next thing you notice are the big letters above the crossfader. As soon as I knew it had a Magvel fader I couldn't wait to try it out. I'd heard good things about this fader and it's something that should excite the scratch addicts here. More on the fader later..
On the back of the unit you'll see a simple on/off switch. A set of master out PHONO sockets, and a set of master out XLR sockets. A set of phono and line inputs for vinyl or CD decks. There's an Aux input for connecting things like effects and drum machines. This is something to help you get creative with your mixes and will please the more experienced DJ's. There's a 1/4" jack microphone input, and a USB port from the sound card for those using Rekordbox. This USB connection will allow you to play tracks from your computers music library. And you'll also be able to record your mixes and rip your vinyl collection straight to Rekordbox. I tried doing both whilst testing the mixer and the sound quality of the ripped music was great. You may have noticed the DJM-250 MK2 lacks a booth output. This means the mixer is not made for use in clubs or large venues. Mobile DJ's may or may not be affected by this, it all depends on the size of your usual gigs. If you play in larger venues and regularly use booth monitors you might think twice before buying. The front of the mixer simply offers a 1/4" jack and a 1/8" mini jack headphone sockets. This is great as you can buy any type of headphone without having to worry about what plug it has. And you can live happily knowing that you won't have to buy any more adaptors. You know the ones that always end up getting lost while gigging. The DJM-250 MK2 features a Magvel crossfader that has been inherited from its big brother the DJM-900NXS2. This is Pioneers top of the range crossfader and I really like the way it feels. It gives a super smooth and very light floaty feel, and in action it performs great! This is because it uses contact free magnetic technology. Pioneer even claim that it is super durable and will last for ten million movements. This will be appreciated by turntablists and DJ's that love to scratch. You'll also notice how spacious the area around the crossfader is. This is what attracted me to the mixer as there's nothing worse than controls hitting your hands while scratching. The Magvel crossfader is also perfect for general mixing when set to normal mode. This is done using the crossfader curve adjust up above. In the bottom section you also get a crossfader reverse and 2 very nice feeling up faders. And two cue buttons to isolate the channels in your headphones. Moving on up we see the sound color FX panel. This is another feature inherited from the DJM-900NXS2. The DJM-250 MK2 has two high/low pass filters that can be adjusted using the parameter knob to the left. This allows you to change the sound of each filter. You also have a filter button in the middle that turns the filter on/off. This is great if your using the filters and need to instantly return to the normal position. It basically allows you to use the filter right until the last possible millisecond. It's much easier than having to quickly return the knob to the 12 o'clock position. Up above we get a 3 band EQ with trims. And a full set of VU meters for channel 1, channel 2, and master output signal. These will help you to keep your levels in check to avoid audio clipping which can result in equipment damage. Up above these you get a simple switch to switch between inputs. Over on the left you have your Aux panel to control auxiliary inputs like drum and effect machines. Below that you have your microphone control with a simple volume and tone adjust. On the right is the master level knob for controlling your main volume. And below that the headphone cue and volume adjust. As we mentioned earlier, the DJM-250 MK2 is bundled with the Rekordbox DVS add on. For anybody new to DJing a DVS lets you play tracks from your computer using a control vinyl or CD. You'll only ever need two vinyl/CD's as they are encoded. This means every movement of the record or jog wheel will be picked up and sent to the software. This allows cueing, nudging, and scratching and behaves just like normal vinyl/CD. A DVS is the perfect choice for anybody that wants a more traditional feeling set-up. It also saves on buying expensive vinyl and gives you the ability to use special features like loops and effects. The DJM-250 MK2 is DVS bundled and ready to go, and you won't need a separate sound card. But if you like the sound of a DVS you'll have to buy the control vinyl/CD's separately. You can also use the DJM-250 MK2 without software. This is the perfect set-up for beginners as it takes away the software's many distractions. This lets you concentrate on perfecting your beatmatching and mixing skills. Once you have the mixing down the DJM-250 MK2 will continue to grow with you as you incorporate the software into your set-up. 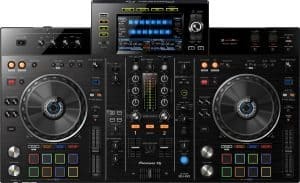 I loved testing this mixer and would recommend this to beginners and DJ's moving up the ladder. The lack of booth output is the only real letdown and it's a shame that this mixer will never make it to the clubs. Again, this is something to think about if you're a mobile DJ that plays larger venues. If you use booth monitors regularly this probably isn't the mixer for you. The Pioneer DJM-250 MK2 is capable of more advanced DJing and excels in scratching due to the Magvel crossfader. This crossfader really is one of the best I've ever felt, and I've owned/used a lot of mixers (including Rane scratch mixers). The DJM-250 MK2 really means business. If you're an aspiring DJ or turntablist I'd have no hesitation in recommending this to you. If I was just starting out this would be at the top of my list. And what's even better, it will continue to grow with you with the inclusion of the Rekordbox DJ software. With its tough steel construction you can expect the DJM-250 MK2 to last you for many years. Very well priced to fit any budget. Simple layout appeals to beginners and turntablists. Comes with Rekordbox DJ and DVS software. Includes a Magvel crossfader with super smooth operation. Lots of connectivity on the rear of the unit. Aux input broadens its appeal to more advanced DJ's. Soundcard only works with Rekordbox. Other software will need an interface. Or you can buy the Pioneer DJM-S3. Thanks for checking out my review of the DJM-250 MK2. If you decide that this is the one for you, I'm very sure that you'll love it! If you're just starting out as a DJ you'll like my FULL GUIDE covering everything you need to know > HERE. Have you looked at any DJ controllers yet? See the top controllers on the market here.